Efforts to raise Anchorage's marijuana sales tax failed this week after elected officials decided the marijuana industry was paying for itself, and that the higher tax would be unfair to new businesses. The tax increase failed 8 to 2. Assembly members Eric Croft and Fred Dyson were the dissenting votes. "The tax structure we have on this business is not onerous compared to other states," Croft said during discussions. "Certainly not onerous compared to it being a felony before, guys." In mid-June, the mayor's office introduced an ordinance to increase the marijuana sales tax from 5 to 7 percent. The administration of Mayor Ethan Berkowitz said Thursday the tax money would have offset property taxes and offset the cost of public safety and drug and alcohol abuse. Chris Schutte, director of Anchorage's Office of Economic and Community Development, said earlier that the city was requesting the tax increase for two reasons: City departments are spending more money working with the industry than anticipated, and the city has a limited time frame in which to raise taxes. The city can raise the marijuana sales tax by 2 percent every two years, up to a maximum of 12 percent. Assembly member Amy Demboski on Tuesday asked city budget director Lance Wilber to drill down on some of the costs to the city. Wilber told the assembly that startup costs for various departments had been estimated around $615,000, and a "conservative" estimate of annual costs to the city was $350,000. The city received $1.26 million in sales tax in 2017, according to municipal data. "Clearly the industry has already paid for its cost," Demboski said. Assembly member Pete Petersen said businesses could choose to move out of Anchorage if the regulatory climate became too challenging. "I just think increasing the tax at this point is unfair, and I believe we would end up shooting ourselves in the foot," Petersen said. During discussions, Petersen made a comparison to the alcohol industry. Alcohol sales in Anchorage were estimated at $300 million in 2017, he said. "Taxes paid by the alcohol industry to the Muni of Anchorage: Zero," Petersen said. Croft, who voted for the tax increase, called it a reasonable request. Marijuana was legalized "largely on the promise that there would be some revenue to solve a lot of the problems we're facing," Croft said. Before the assembly's vote, 16 people spoke out against the tax, mostly marijuana business owners and people affiliated with the industry. They argued that the tax increase was too soon, as Anchorage shops have been open for less than two years. They spoke about the existing tax burdens on businesses, including federal tax code 280E, which prohibits marijuana operations from deducting normal business costs. "Cannabis retail operations in the state are being taxed 60 to 90 percent as is," said Aaron Morse, who said he is affiliated with marijuana store and growing facility Great Northern Cannabis. Others talked about how businesses absorb the increase, instead of passing the cost along to consumers, as shops struggle to keep up with black market prices. Legal marijuana sells wholesale for as low as $2,500 a pound, said Jana Weltzin, marijuana attorney. Black market marijuana is around $1,500 to $2,000 a pound, she said. A perception that regulated marijuana is more expensive means that consumers will be less likely to give up their black market dealer, Weltzin said. Other local governments have a cannabis sales tax, too. The Matanuska-Susitna Borough and both the city and borough of Fairbanks, have implemented a 5 percent cannabis sales tax. Juneau taxes marijuana at 8 percent. On the state side, weed taxes fall to the grower. Cannabis cultivators pay a flat-rate, $50-an-ounce tax on marijuana flower, and $15 an ounce on trim, which are the leaves and stem of the plant that can be used to make edibles and other products. 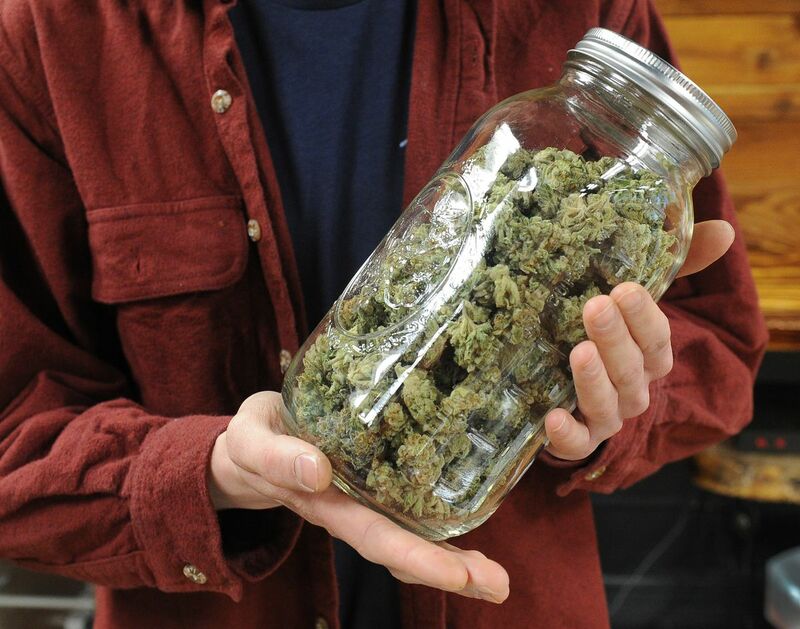 Consumers in Alaska have spent upwards of $100 million at pot shops since legal marijuana sales began in Alaska in October 2016, according to the Alcohol and Marijuana Control Office. Correction: An earlier version of this story erroneously said that Juneau's marijuana sales tax is 7 percent; it is 8 percent.